Bluetooth 4.2 and EDR Technology. With Bluetooth 4.2 Technology and EDR Technology, the FM transmitter features more stable connection and audio stream, supports faster transmission and lower power comsumption. What's more, bluetooth can be automatically reconnect. Dual USB Ports and 1.44”LCD Display Screen. With 5V/2.4A USB port, your IOS or Android device will be more faster charged while you enjoy the in-car stereo streaming, The other port supports music playing from U-disk; 1.44 inches screen will display the Real-time Voltage of your car when starts, and Rotate the screen to switch songs or to adjust FM frequency. HIFI Clear Sound Quality. Support Non-destructive sound transmission for music playing via Bluetooth, U-Disk and TF Card. CVC noise cancellation technology helps promote clarity for both music and hands-free calls. Universal Compatibility and Aux Output. 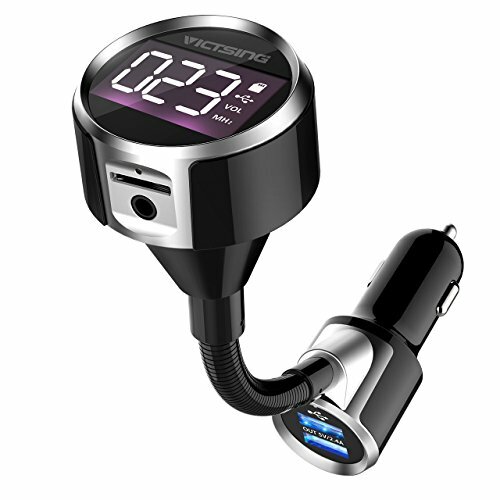 VicTsing FM Transmitter can not only play music from Bluetooth-enabled devices, but also plays music from U-disk or TF card in MP3/WMA/WAV/APE/FLAC format. It is compatible with iPhone X/8/7/7 Plus, iPad, iPod, tablet, Android smartphones. Moreover, you can use the included 3.5mm audio cable to transmit music through Bluetooth if your car has aux port. Applicable to all 12-24V car models. One Key Quick Operation and Hand-Free Call for safe driving. Save you effort of controlling music and phone call while driving and make driving be easier and safer. Rotate the screen to switch songs or to adjust FM frequency. Short press to play or pause. Answer/hang up/reject a call/redial the last number by pressing the button.Built-in microphone, the FM transmitter offers you hands-free talk for safe driving. Voice reminder will broadcast incoming phone number. Dual USB Ports and 1.44"LCD Display Screen. With 5V/2.4A USB port, your IOS or Android device will be more faster charged while you enjoy the in-car stereo streaming, The other port supports music playing from U-disk; 1.44 inches screen will display the Real-time Voltage of your car when starts, and Rotate the screen to switch songs or to adjust FM frequency.